A spate of wildfire activity in Southcentral Alaska on Thursday is proof that wildland fire season has arrived in Alaska, even though much of the northern half of the state remains covered in snow. The Alaska Division of Forestry’s Mat-Su Area office in Palmer responded to six small wildfires on Thursday – five in the Mat-Su Valley and one along the Seward Highway south of Anchorage. With the help of local fire departments, Forestry personnel were able to extinguish all six fires in quick order but the rash of fires illustrates how dry conditions currently are in Southcentral Alaska now that most of the snow has melted in that part of the state, leaving dried grass and other fine fuels exposed. Four of the five fires in the Mat-Su Valley were caused by exhaust from a backfiring pickup truck catching grass on fire and the other was a grass fire involving three hay bales. The cause of a 2-acre fire south of Anchorage that shut down the Seward Highway for two hours, meanwhile, is under investigation. 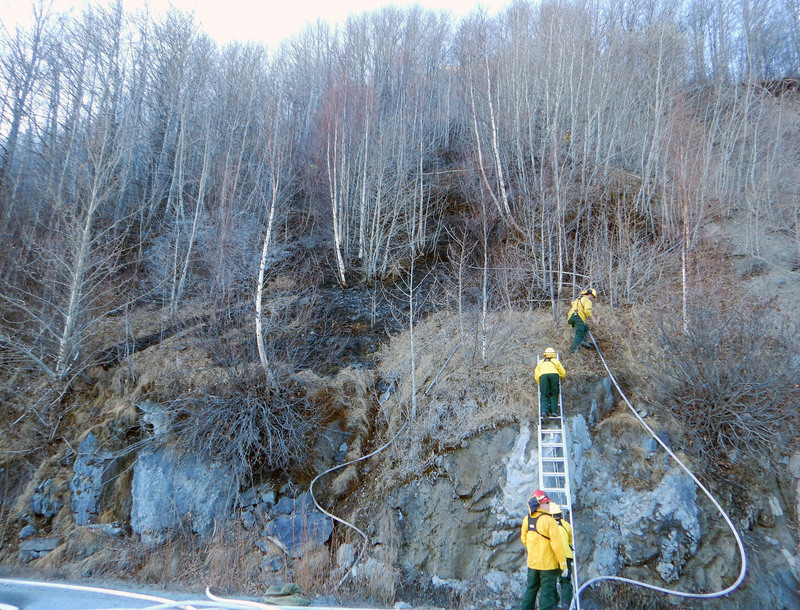 The Beluga Fire near Mile 105 of the Seward Highway was reported early Thursday evening and the Anchorage Fire Department requested Forestry’s assistance because the fire was located about 100 yards up a steep bluff. Firefighters from AFD used a ladder to access the fire. Forestry responded with four engines and approximately 10 personnel and the fire was contained and controlled within about 2 ½ hours from the time it was reported. The public is reminded that as of April 1 a burn permit is required for the use of burn barrels and any outdoor burning in areas under Division of Forestry fire protection, with the exception of small (3-foot-by-3-foot) warming or camp fires. Forestry prevention personnel have already issued six warnings this month to individuals who did not have burn permits or were not following the safe burning guidelines spelled out on the permit. Burn permits are available free of charge at local Forestry offices, many local fire departments and online at http://forestry.alaska.gov/burn. For more information, contact Forestry public information officer Tim Mowry at 907-356-5512 or tim.mowry@alaska.gov.